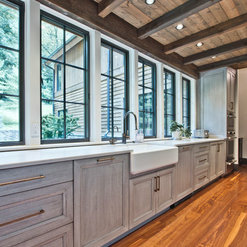 Hermitage Kitchen Design Gallery offers remodeling of kitchens and bathrooms and has a wide range of cabinet, plumbing, lighting and countertop lines that our designers custom tailor to meet any and every budget. It was and is a pleasure to work with Terri Sears and her staff at Hermitage on our new home. She had such patience with my indecisions and helped steer me in the right direction. She designed our Master bath, and planned a design for our kitchen. Our home is still a work in progress, but I look forward to her input in the final stages of completion. She is an asset to the Hermitage team, and a wonderful professional to work with. Thank you for such a nice review! We hope you are enjoying all of the updates to your bathrooms and laundry room. We look forward to helping you make any decisions as you continue updating your home. Its been over a year since our kitchen was finished and we are just as excited today as the day it was put in. Working with Terry was a breeze — she was able to take all our random ideas and turn them into something beautiful after we gutted our 20 year old kitchen. We were very happy with the process as well as the products they recommended. Looking forward to working with her and her team on future projects! Thank you for your kind words! We are thrilled that you are still loving your beautiful kitchen and also look forward to working with you again in the future. 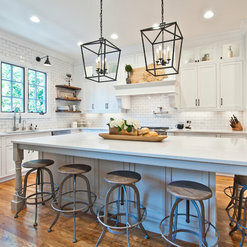 Victoria and her team were amazing to work with on our kitchen and basement renovation! We have never had a renovation project go so smoothly. Victoria took the time to get to know us and our style. The contractors were great at cleaning up at the end of the day and kept the dust to a minimum. We are in love with our new kitchen as we spend most of our time in there. Now we can't wait to start on our bathrooms! 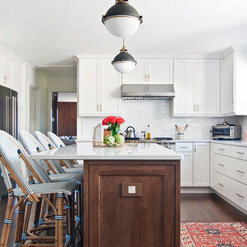 We are so pleased with the kitchen from Hermitage. Terri was our designer and was so helpful on so many levels. Our re-modeler, Kris, was the best. He was a hard worker and very precise with his craftsmanship. Kudos to everyone at Hermitage. Terri and Carla were fantastic throughout the process in making sure that my wife and I got the kitchen of our dreams. 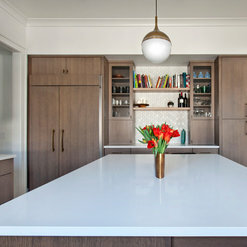 They were both extremely thorough and meticulous throughout both the design and ordering process of cabinets and hardware. 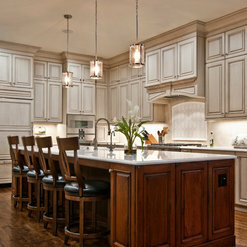 I highly recommend Hermitage Kitchen Design Gallery for any kitchen or bathroom remodel. Educated, diligent and thought out! 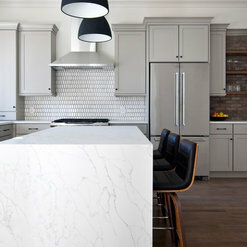 When I was ready to redo my kitchen, I searched Houzz for someone I could trust being fairly new to Nashville.. Hermitage and Terri Sears had a fabulous rating so we interviewed her for the job. She did not disappoint! The entire Hermitage team was professional, timely, courteous, and frankly, so much fun to work with. 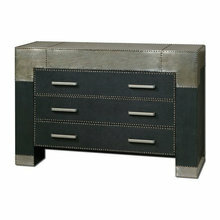 I brought in a designer, Elizabeth Murphy, from Boston who has worked with me on the rest of my home. 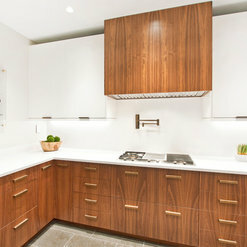 Terri worked so well with her and together they created a true chef's kitchen, suited exactly to my cooking needs. I would use her whenever possible, she's amazing. Thanks Terri for all you've done to make this kitchen stunning! We had a wonderful experience with Terri Sears and Hermitage Kitchen Design Gallery. Very happy with our new kitchen. We would use her again. Everyone I personally worked with esp Carla Taylor and Teri Sears were focused on my project and always available to guide my decision making and answer my questions. Carla personally checked on my project several times when I was out of town to assure work was being completed on time and according to my desires. Teri also went to the job site to confer with me about a few concerns I had. Both women helped keep me within my budget by assisting me in my choices. I appreciated their combined ideas on both materials and design. The knowledge and work quality of ALL involved resulted in a fabulous renovation and I would recommend Hermitage Lighting to others. I am very satisfied. Carla's cabinet design far surpassed my expectations. Our bathroom is stunning! She was professional, creative and a delight to work with. Highly recommend. Hermitage is very professional and a joy to work with, thanks to Carla and her team who are very knowledgeable and helpful in their design process. Every project we have completed with them has been effortless thanks to their skill and knowledge. They know exactly would they would like, so the design and construction of every project can be easily completed based on their needs. We would recommend them to anyone! Thank you for your compliment on our work! We appreciate having an amazing company like FourSeasons to work with for our metal needs! The team was very responsive to any questions or concerns. They worked with my schedule to install the cabinets and appliances. We are very glad you had a good experience with us! Thank you for your business and enjoy that beautiful new kitchen! 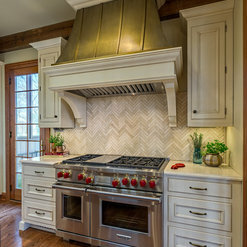 The design team at Hermitage Kitchen Design Gallery in Nashville is one of the best in the Southeast. 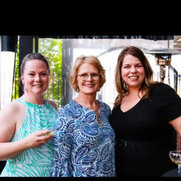 Carla, Melissa and Terri are talented, knowledgeable kitchen and bath designers with the experience to make your dream project come true regardless of the size, complexity or design theme. Before making your final decision, be sure to consult with the design team at Hermitage Kitchen Design Gallery. You will be very pleased with the experience! Thank you for the compliments on our work! 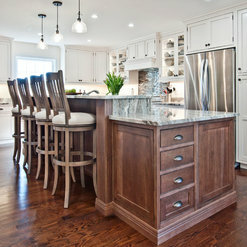 We are lucky to have such quality cabinetry available from Mouser Cabinetry to work with! Commented: Shower dimensions please?Hi Susan! The shower dimensions are 38.5 W x 65 1/8 H. Good Luck with your project! Commented: What grout spacing did you use between the tiles in the shower?Hi Skippy! We used an 1/8 of an inch spacing! Hope this helps and Good Luck with your project! 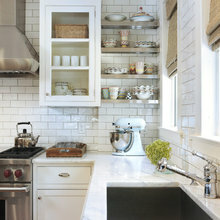 Commented: Hi, what is shower wall subway tile size?Hi Amanda! The shower subway tile is 4&quot;x12&quot;. Good Luck with your project! 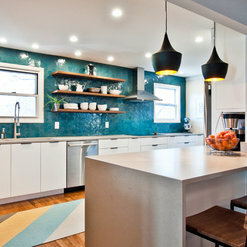 Commented: What color grout did you use?Hi Kristine! The grout we used was Sterling 909 Tec. Good Luck with your project! Commented: love the look of this faucet. Do you know who makes it?Hi Lisa! 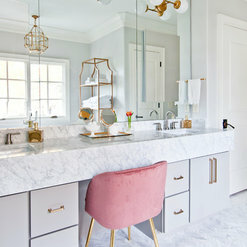 Yes, the faucet is from Brizo and it is polished nickel. Good Luck with your project! Commented: What color is the wall paint?Thank you for your kind words! Unfortunately our client had their own painters and we do not know the paint color. Good Luck with your project!